ORLANDO, Fla. — Get this: There are times when Missy Franklin is frustrated. OK, it’s not as if she’s suddenly turned all cranky and rude. The Olympic champion still walks around the pool with a perpetual smile. But subpar performances over the past year have started to get under her skin a bit. With the Rio Games just five months away, she knows it’s time to start producing. At 17, Franklin was one of the biggest stars at the London Olympics, competing in seven events and winning four gold medals and a bronze. Away from the pool, her bubbly personality only enhanced her appeal, though she didn’t cash in right away since she wanted to compete collegiately. After two years at Cal, Franklin finally turned pro last year, setting up some major endorsement deals heading into Rio (she’s already landed with Speedo and Minute Maid). But, while she has a lot more money in her pocket, it’s been a struggle to regain the form that made her the world’s most dominant female swimmer — a title ceded to fellow American Katie Ledecky. At the 2015 world championships, Franklin failed to win any of her four individual events, settling for a silver and two bronzes. In the last Pro Series meet at Austin, Texas, in January, she again failed to win any individual events and, tellingly, trailed far behind Ledecky in the 100- and 200-meter freestyles. The key, she said, is using that angst the right way. In addition to turning pro, Franklin moved back to her Colorado home and reunited with longtime coach Todd Schmitz. They’ve been adapting to a new style of coach-athlete relationship, one that the 20-year-old swimmer calls more of a partnership. Schmitz has prodded Franklin to turn some of the tough times into motivation leading to Rio. He’ll even bring up the London Olympics, where things went so well. Away from the pool, Franklin has started working on a book with her parents. She calls it “a family memoir,” a chance to reveal how the three of them were “able to stay true to ourselves and true to each other” even as Franklin became a teenage phenomenon. Titled “Relentless Spirit,” the book is due in early December. You know what would help sales? A few more gold medals. Franklin isn’t one to make bold predictions. Like most swimmers, she can’t even bring herself to say definitively she’ll be in Rio since she still has to go through the ultra-competitive U.S. Olympic trials. But she certainly hasn’t lost her confidence. For the second straight day, Bremerton’s Nathan Adrian helped Team USA to gold, this time in the 4×100 medley relay at the World Swimming Championships in Kazan, Russia, Sunday. The Americans, including Ryan Murphy, Kevin Cordes, and Tom Shields, won in 3 minutes, 29.93 seconds. Australia earned the silver in 3:30.08 and France took the bronze in 3:30.50. Adrian, swimming the freestyle anchor leg, had a split time of 47.41, but it was Australia’s Cameron McEvoy who was charging hard right next to him and nearly clipped him at the wall. McEvoy’s split was 46.60. “I don’t even know the times. I don’t know what anybody split, really,” Adrian said. “Obviously all four of us did our part, or we wouldn’t be on top of the podium. We had four great swimmers on that relay right there, and we needed four good swims. None of us needed to be great, but we had to have four good swims. 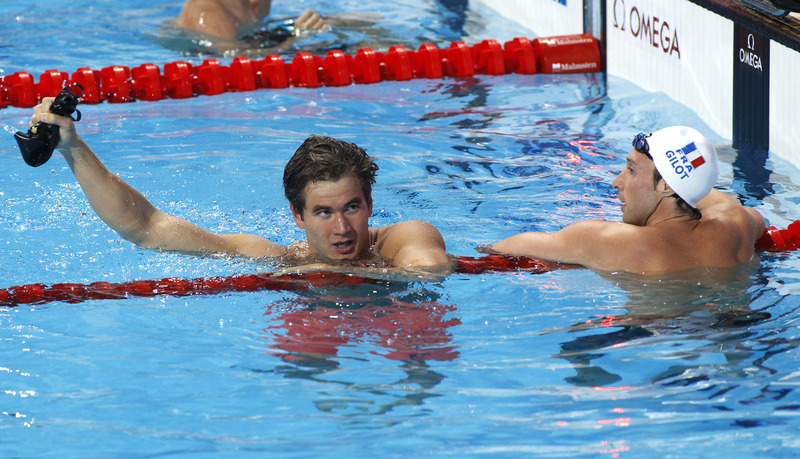 Two years ago the U.S. was disqualified when Cordes dived in too soon on the breaststroke leg. It wasn’t quite the dominating swim he had in the semifinals, but Bremerton’s Nathan Adrian added to Team USA’s medal count with a silver in the finals of the 50-meter freestyle Saturday at the World Swimming Championships in Kazan, Russia. 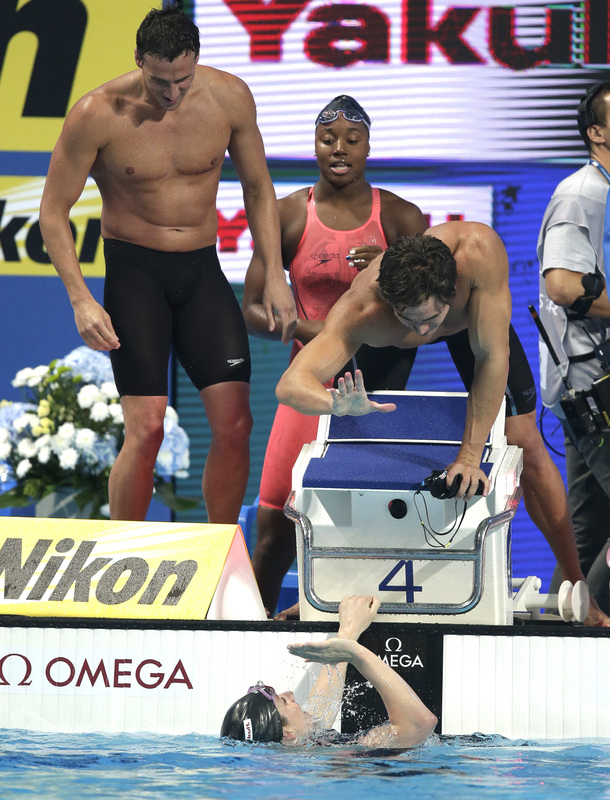 Adrian also teamed with Ryan Lochte, Simone Manuel and Missy Franklin to win gold in the 4×100 free mixed relay in a world record time of 3 minutes, 23.05 seconds, holding off the Netherlands in 3:23.10 and Canada in 3:23.59. Adrian’s split was 47.29, his fastest time of the year. In the 50, Adrian touched the wall in 21.52, right behind world and Olympic champion Florent Manaudou of France in 21.19. Bruno Fratus took the bronze in 21.55. Vladimir Morozov of Russia was fourth in 21.56. Adrian posted an American record from the semifinal Friday in 21.37, something he’d been gunning for since 2009, but didn’t quite have that time to match Manaudou in the final. 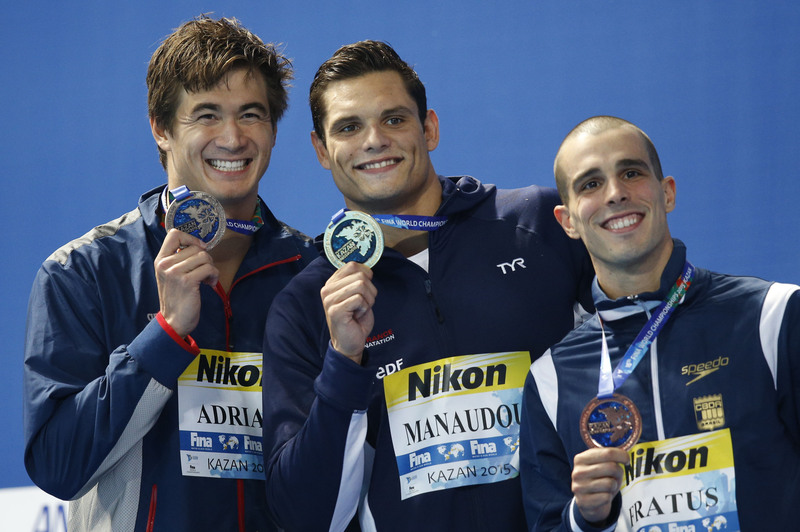 Adrian said he knew Manaudou got off the blocks quick and that he was ahead the whole way. Adrian has one more race left at this worlds, Sunday’s 4×100 medley relay where he’ll anchor the men’s team. Bremerton’s Nathan Adrian produced the world’s fastest time so far this year after dominating the first semifinal Friday of the 50-meter freestyle at the World Swimming Championships in Kazan, Russia. Bremerton’s Nathan Adrian celebrates after the first 50-meter freestyle semifinal at the World Swimming Championships in Kazan, Russia, Friday. Adrian set an American record in 21.37. Adrian blew away the rest of the field in 21.37 seconds and set an American record and personal best. The old record was 21.40 by Cullen Jones at the 2007 Worlds in Rome. Florent Manaudou of France had the second-fastest time in 21.41 followed by Brazil’s Bruno Fratus in 21.60. “I wouldn’t want to walk away from this meet knowing I had more in me,” he said in an online interview with Eurosport.com. He also knows the final will be fast with Manaudou, who Adrian considers the best 50 freestyler in the world, right next to him. The finals are Saturday morning local time. Maybe using a bit of frustration as motivation, Bremerton’s Nathan Adrian had the second-fastest qualifying time in the 50-meter freestyle at the World Swimming Championships in Kazan, Russia, late Thursday evening. Adrian won his heat in 21.73 seconds. Florent Manaudou of France was the top qualifier in 21.71 seconds. Adrian is coming off a disappointing finish in the 100 freestyle on Thursday, where he placed seventh. The semifinals/finals session begins at 7:30 a.m. locally. On Wednesday, Bremerton’s Nathan Adrian went out too fast in his first 50 meters of the 100 freestyle semifinals and faded in the final 50. On Thursday, Adrian took a different tact and stayed with the pack in the final, but didn’t have the closing speed and wound up a surprising seventh place at the World Swimming Championships in Kazan, Russia. Adrian tied with Pieter Timmers of Belgium in 48.31 seconds. Chinese newcomer Zetao Ning won in 47.84, followed by Australia’s Cameron McEvoy in 47.95 and Federico Grabich of Argentina took the bronze, 48.12. Adrian went out in 23.11 in his opening 50 (he went 22.45 on Wednesday) and came back in 25.20 but it was clear Ning was going to win gold. 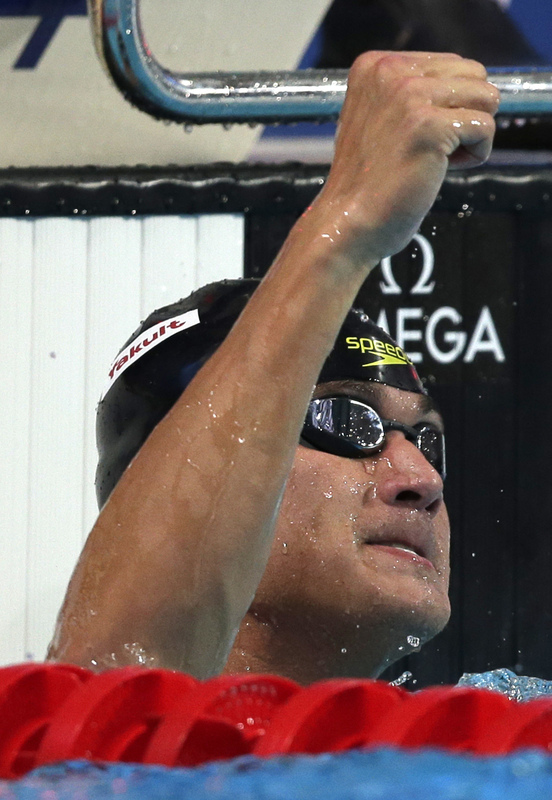 Ning is the first Chinese male swimmer to win the event at worlds. Adrian still has another individual event to go, the 50 freestyle, as well as the 400 medley relay. The prelims for the 50 begin at 11:30 p.m. locally Thursday. Bremerton’s Nathan Adrian, the defending Olympic champion in the 100 freestyle, will be going for his first World Championship when he takes to the water tomorrow in Kazan, Russia. Adrian qualified in fifth with a time of 48.36 seconds in Wednesday’s semifinals at the Kazan Arena pool. Adrian had a strong first 50 meters in 22.45 seconds, including a great start off the block with a .67 second reaction time, but faded in the second 50 (25.91) as the rest of the field caught up to him. He finished fourth in the first heat. You can listen to him talk about the race via audio from Swimming World. Adrian said in a post-race online interview with Eurosport.com that the race was good, but it wasn’t as fast as what the swimmers in the 200 freestyle were producing. “It doesn’t mean tomorrow’s not going to be fast,” he said. Adrian said it’s time to go back to Team USA and rest and recover for the final. “Just going to … prepare and try to be better,” he said. Australia’s Cameron McEvoy had the top time, winning the first heat in 47.94 seconds, his first time under 48 seconds this year. China’s Zetao Ning was second in 48.13. Russian favorite Vladimir Morozov was disqualified after jumping at the start off the block, sending a shudder of disappointment through the pro-Russian crowd. His reaction time was under .50 seconds. 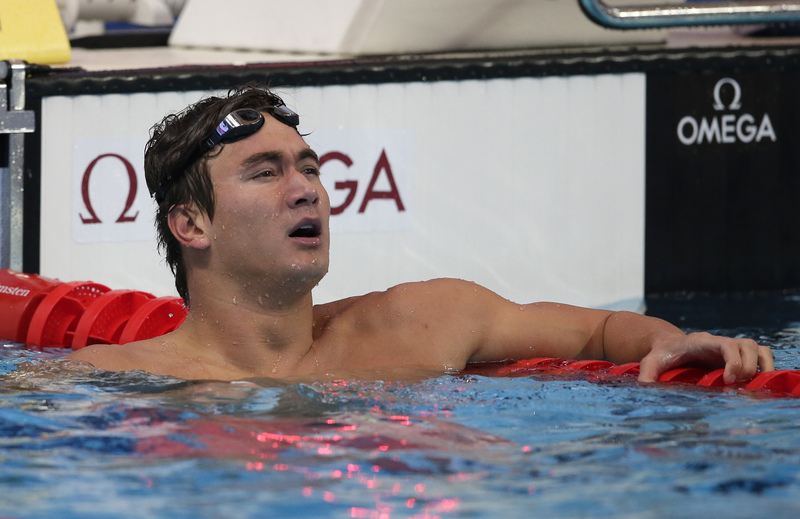 It took four days of waiting but Bremerton’s Nathan Adrian finally got into the competition pool at Kazan Arena in Russia early Wednesday morning at the FINA World Swimming Championships. Adrian, swimming in the 11th of 12 heats, touched the wall in 48.61 to tie with Sebastiaan Verschuren of the Netherlands for seventh and qualified for the semifinals. The semis/finals session begins at 7:30 a.m. locally. Adrian led for the first 50 meters but then the rest of the field caught up as he finished fourth in the heat. In a post-race online interview on EuroSportLive.com, Adrian said it felt good to race. When asked what he thought of the semifinals field, Adrian smiled. Asked if he thought he’d make the podium, Adrian laughed and smiled again. The only thing I dislike about covering international swimming events (note: I’m not in Russia. I haven’t covered an event since the Olympics in 2004 in Greece), is figuring out the time zone change from whichever country Nathan Adrian is swimming in to what time it is here in Bremerton and Pacific Daylight Savings time. This time he’s half a world away in Kazan, Russia, for the FINA World Championships. Nathan will swim his first prelim, the 100 freestyle, starting tonight at 11:30 p.m. It’s actually 9:30 a.m. in Kazan. The semifinals/finals sessions begin for us at 7:30 a.m. (5:30 p.m. in Kazan). That means that Nathan will swim overnight and then, if everything goes according to plan, he’ll swim in the morning in the evening session. I’m going to stay as up-to-date as I can on the blog and Twitter, you can follow me @AnnetteKSSports, late tonight and then I’ll update the blog in the morning following the evening session. It’s a little confusing, but that’s why I’m here. We’ll get through it together! It looks like Nathan will be swimming every day from here on out at Worlds as he also has to swim the 50 free. I’d be hard-pressed to think he wouldn’t be on the medley relay on the final day.